I recently listened to the Freakanomics Radio episode “Preventing Crime for Pennies on the Dollar” about a program called BAM (Becoming A Man). They are based in Chicago and are largely successful because they use Cognitive Behavioral Therapy (CBT) groups with teenagers to help them build skills to better handle life. They have been researched and proven to be successful for over nearly a decade. However, the host of the show, Stephen Dubner, still asked, “What’s the secret ingredient?” I would argue that the “secret ingredient” is the genuineness of the people working with the students. Not the program. The curriculum is clear and easy to use. The training is thorough and repetitive. There is a commitment from the facilitator to stick with the group all the way through. The facilitator likes teenagers. Really, genuinely likes working with teenagers. The teens are invested in the process and accept this as their group. You are likely to find niches in communities across the United States, maybe even the world, that are working hard to help teens. But the one thing that will make the difference is whether or not the people running the program are in it for the students rather than for another reason. 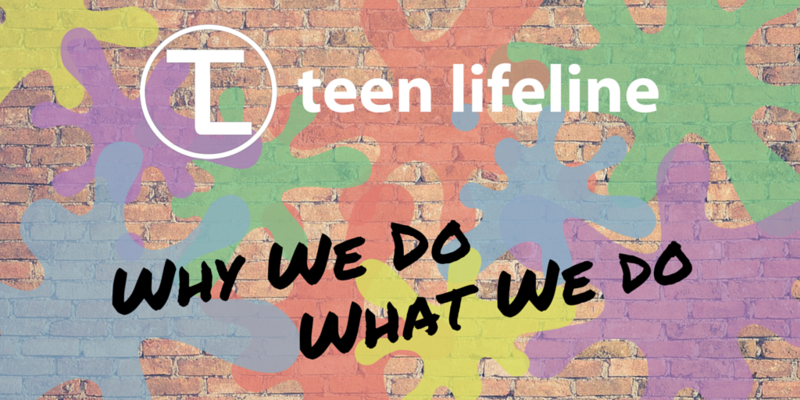 This is what makes Teen Lifeline different. This is why we do what we do.